HOLIDAY DVD FOR ONLY $45! A fascinating tour of Los Angeles told through vintage images. 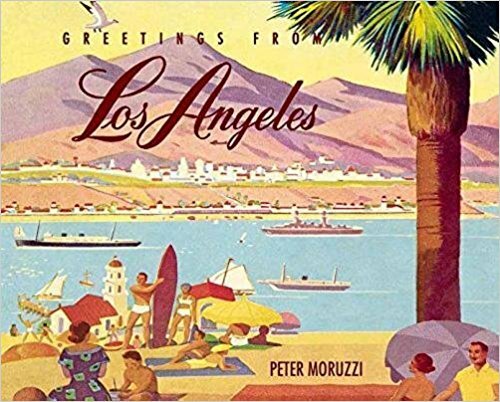 Featured are rare glimpses of the city’s early years as a dusty pueblo; Chinatown’s evolution; the miraculous orange empire; backyard oil wells; Venice of America; the roaring 1920s and corrupt 1930s; colorful evangelists; glamorous Wilshire Boulevard; fabulous nightclubs; movie studios and lavish stars’ estates; and theme parks such as Disneyland, Knott’s Berry Farm, and Marineland of the Pacific. Witness the birth of midcentury modernism, futuristic Googie coffee shops, and space-age LAX. Recall a postwar suburban paradise of drive-ins, bowling palaces, beach parties, Dodgers baseball, hot-rod culture, and mushrooming tract developments. California natives, newcomers, and vistors alike will discover a largely forgotten history of Los Angeles, much of it lost to progress, as chronicled from the late 1800s through the mid-twentieth century. Peter Moruzzi graduated from the University of California at Berkeley and later attended the American Film Institute in Los Angeles. In 1999, he founded the Palm Springs Modern Committee and currently lives in Palm Springs. He is the author of Palm Springs Holiday, Palm Springs Paradise, and Havana Before Castro.